The market is segmented by Type (Commercial Aircraft, Military Aircraft, General Aviation), and Country. 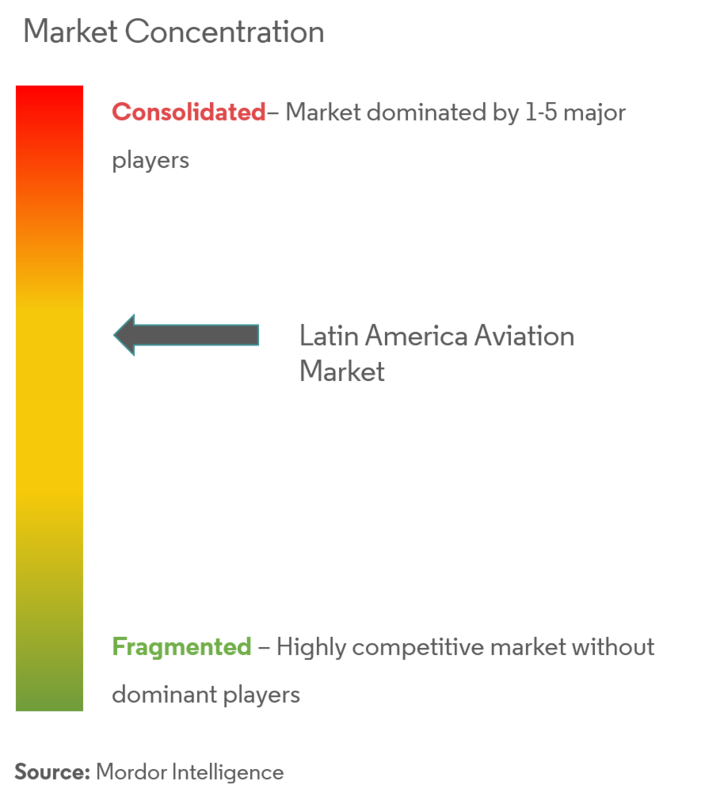 The Latin America aviation market is anticipated to grow at a CAGR of over 2% during the forecast period. The growth of low-cost carriers in the region is acting as a major driver for the growth of the aviation market in Latin America. Privatization of airports in countries like Jamaica, Honduras, Paraguay, and Peru is also supporting the growth of the aviation market in the region. However, the economic instability has led to decreased expenditure by the government in a few countries which can hamper the growth of Latin America aviation in the coming years. 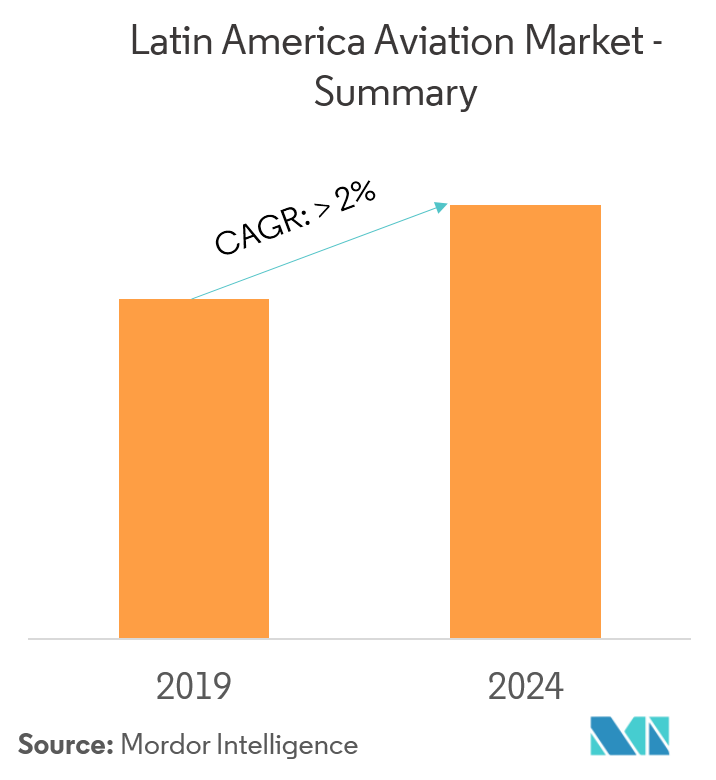 The commercial aviation segment in Latin America is anticipated to register the highest CAGR during the forecast period. In terms of air passenger traffic, Brazil registered a 3.3% year-on-year growth during the 2017-2018 period. Azul, LATAM, GOL, Volaris, and JetSmart are some of the major airlines operating in the region and have huge order backlogs. In addition to regional airlines, foreign airlines are also expanding into this region. For instance, Norwegian Group set up Norwegian Air Argentina in January 2017 and commenced operations from October 2018. 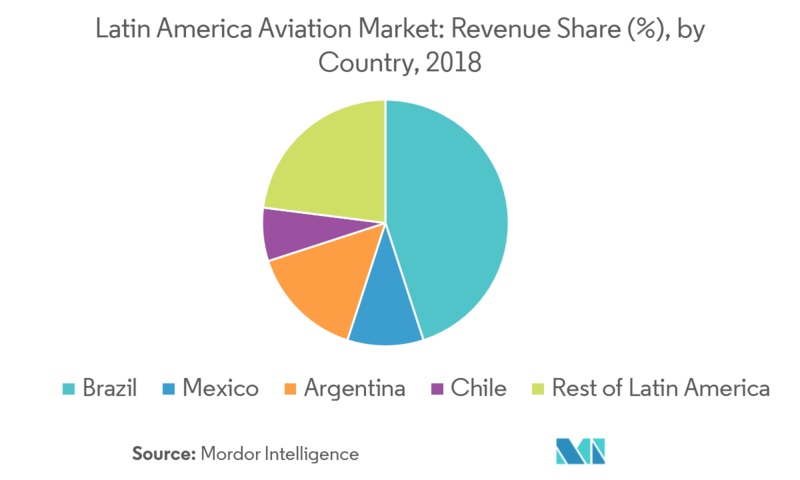 As of December 2018, Brazil had the highest market share in the Latin America aviation market. Brazil is one of the booming markets in the aviation industry and is also one of the top 15 military spenders in the world. In the past few years, the Army and Navy of Brazil received funds to replace its aging aircraft fleet. Brazil signed a contract with Saab AB to acquire 36 Gripen NG fighter aircraft for the Brazilian Air Force worth USD 5.4 billion. The contract was signed in October 2014 with deliveries to begin by mid of 2019 and run through 2024. In order to improve air travel across the country, the government of Brazil announced its plan to privatize 20 airports. The on-going investments in airport infrastructure and the increasing fleet of airlines are propelling the growth of the aviation market in Brazil. Some of the prominent players in the Latin America aviation market are Embraer S.A., Airbus SE, The Boeing Company, Bombardier Inc., and Lockheed Martin Corporation. The current ongoing talks on the partnership between Embraer and Boeing, under which Boeing plans to take 80% share in Embraer's commercial aircraft portfolio and aftermarket support services may have a positive impact over the aviation market in Latin America. This partnership received its approval from the government in January 2019 and is expected to be closed by the end of this year. Boeing and Embraer are also in plans to form a second joint venture for the KC-390 military transport aircraft, in which Embraer will hold a 51% stake and Boeing the remaining 49%. Such partnerships and joint ventures are expected to make the market more consolidated.